The Brambell Natural History Museum at Bangor University is home to a two-faced lamb. J.K.Rowling holds six honorary degrees including one from St Andrews University in 2008. The inventor of Jelly Tots,Dr Brian Boffey,is a University of Sheffield alumnus. The University of London was the first to admit women. You lose two close friends for every person you fall in love with,according to Oxford University researchers. Doctor who apparently has a degree from Glasgow University. The University of Sussex has a campus shaped like a cat. You can study circus performance at Bath Spa. Some scenes from a clockwork orange were shot at Brunel University. At London South Bank University you can get a degree in baking technology. Scientists at Northumbria University have discovered that chewing gum increases our ability to recall information. Scientists at University of Liverpool were involved in cheating britan’s first tear-free-onion. You can study the zombie apocalypse at the University of Winchester. UEL was the first university to conduct a major survey of European e-cigarette users. You can learn Viking studies at UCL. The first rocks to be brought back from the moon were analysed for signs of life at the University of Bristol. 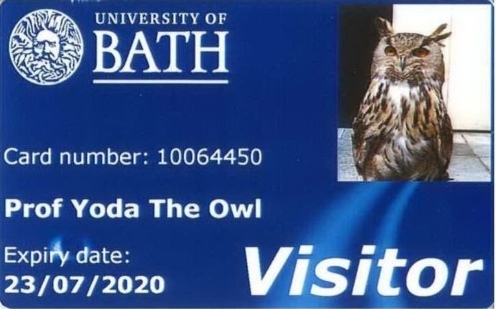 The University of of Bath has an owl(PROF.YODA) that is used to ‘Unsettle Gulls’. Queen’s University Belfast offered a JEDL course.